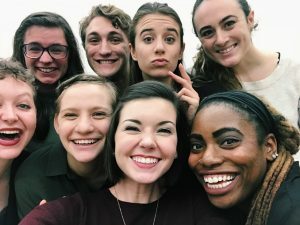 Last Fall, a group of Hope Theatre students started Theatre Symposium. 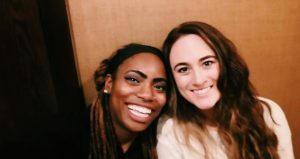 The mission is to give students resources to grow as a theatre artists through conversations and workshops with working professionals, new play readings, and audition techniques. Symposium engages in a holistic, encouraging intra-arts environment by including student artists from a variety of disciplines, bringing them together and connecting them with Hope alumni who are currently working in the arts. One of the ways Symposium is achieving this is through holding “mock” dance calls. Symposium has held two such dance calls to date, intended for Theatre and Dance students; with choreography by Hope Dance Department majors. These audition workshops were monitored by current Theatre Symposium President Katie Joachim. Symposium’s first workshop was with Tiny Breakfast, a Grand Rapids-based improv troupe. Founding members Jake Mate (’17) and Ezra Sprik (’16) led students in various warm-ups and games, and offered tips for how to build and improve strong skills in improv. 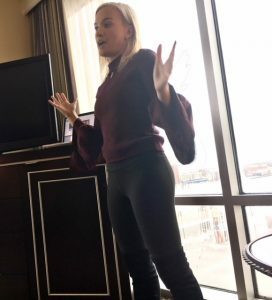 Lauren Ezzo (‘15) has become a prominent figure in the audio book industry (recognition incudes an Audie Nomination for her readings in Nevertheless We Persisted and five “Earphone” awards from Audiofile), came and talked about how to succeed in the audiobook industry and find a niche as an artist after college. 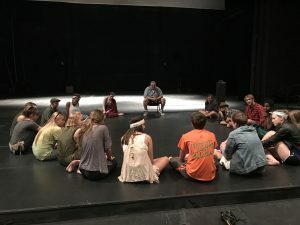 The final visit for the year was a skype call with Eric Van Tassell (’08), Lighting Director of the Sharon L. Morse Performing Arts Center in Lady Lake, Florida, and former Hope Summer Repertory Theatre Production Manager. He responded to student questions about technical applications and walked us through resume and cover letter tips. With elections for next year on the horizon, Theatre Symposium is looking forward to the coming years and how to grow and develop to more fully fulfill its mission. Meetings are held every other Tuesday at 9:30pm in the DeWitt Studio Theater. Please drop by! Send a note to theatre@hope.edu for more information. The Hope College Theatre Department opened our first mainstage production of 2018, “The Glass Menagerie”, this past weekend! The Glass Menagerie by Tennessee Williams tells the story of the Wingfield family. Recalled through the eyes of Tom, the memory play shares the story of his mother, Amanda, and his sister, Laura. As a young girl, Amanda was a fêted debutante with a life of comfort and admiration. Amanda now worries especially about the future of her daughter. As an extremely shy 23-year-old, Laura has yet to find a suitor. Instead, she spends most of her time quietly arranging her glass animals. Tom is a writer who feels trapped in a dead-end warehouse job and dreams of a more adventurous life. 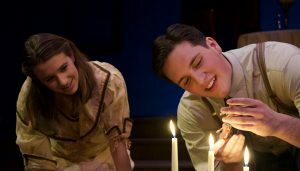 As each escapes into a personal “glass menagerie” the play provides a glimpse into a family that is desperate to break free of the burdens of its past and present. 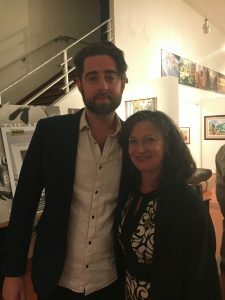 I had the opportunity to sit down with Daina Robins, the director of the production as well as the Chair of the Theatre Department, and ask her a few questions about the process. Olivia: WHAT MADE YOU WANT TO DIRECT THE GLASS MENAGERIE? Daina: I never really thought about directing it. Actually, Rich Perez, [associate professor of theatre at Hope] mentioned it, so I can give him credit for planting the idea. Frankly, it had to do with anticipating that he was going to be casting a large number of women in his production this semester. Partly, it was choosing something that I thought would give three undergraduate students a role that comes by once in your lifetime. Of course, this is the case with a lot of plays, but most of them are not as great [as “The Glass Menagerie”]. To have the experience working on such a classic play allows you to appreciate what a lyrical, musical, and tender writer that Williams is. I’ve seen productions of it, there are film productions of it, but working on it allows you to know it in a deeper way. I think a lot of undergraduate students don’t know the play, and a lot of the people in our audience haven’t seen it. And, we haven’t had Jean [Bahle, adjunct assistant professor of theatre at Hope and also playing the role of Amanda] act for us for a number of years…not since 2004, when we did a production of The Golden Ladder in the studio theatre. I’ve directed her a number of times, and I thought it would be a lovely role for her. 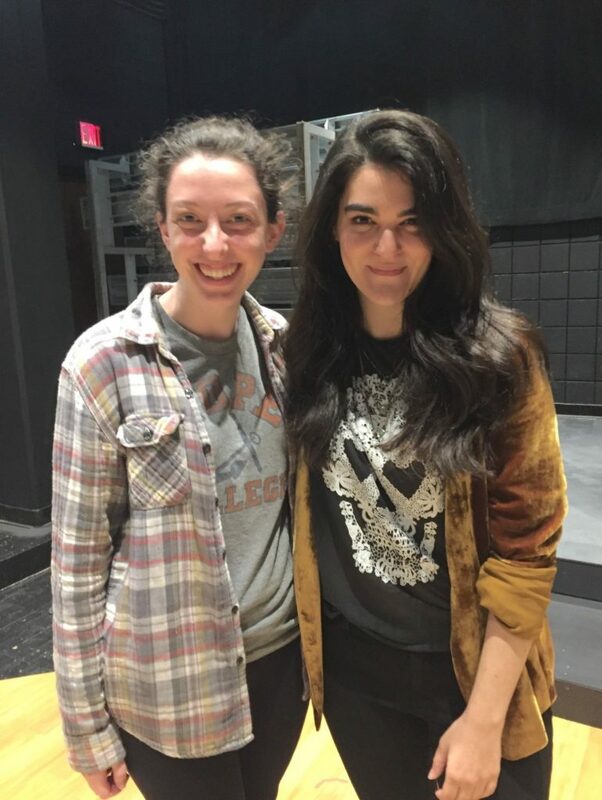 The students really have a chance to learn from her, and I didn’t feel I was taking a role away from a female student because, between the student-directed productions and Rich’s devised piece, I felt there were enough opportunities for the women who were ready for it. So it’s a lot of balancing what you think the department wants and needs, what we can design, and it’s a beautiful play that again I don’t think many Hope students have seen. Olivia: YOU’VE DIRECTED GUEST ARTISTS QUITE A FEW TIMES IN THE PAST, EVEN PRETTY RECENTLY ON JANE EYRE THE MUSICAL AND THE TEMPEST. WHAT IS IT LIKE DIRECTING JEAN, WHO IS ONE OF YOUR COLLEAGUES, ALONG WITH YOUR STUDENTS? Daina: Well, I joke that I’m Jean’s evil twin sister. I met Jean when I first came to Grand Rapids, before I even got the job at Hope. She is such a kind, gentle person, and I’m not [laughs]. But we’ve always kind of really gotten along, and I think we appreciate each other and recognize some kind of simpatico both personality wise and artistically. She’s incredibly easy to direct, because she’s such an open, generous actor. She is used to working with people who are learning, and she’s ahead of the game. She’s a wonderful actor, and she raises the play for everyone else, and she does it in this generous way, you never feel like she’s impatient with others. She’s a sensitive, insightful, and incredibly humble person. Olivia: WHAT IS SOMETHING THAT YOU HOPE OUR AUDIENCE IN HOLLAND WILL TAKE AWAY FROM THIS PRODUCTION? Daina: There’s a whole history surrounding the play, and I think on one hand we’re honoring that. I think sometimes Amanda gets a raw deal. I really empathize with her…she is alone, she’s raised these children on her own, it’s coming out of the Depression…she makes total sense to me. Yes, she has wonderful memories of her youth…but I don’t even blame her for that. I have a lot of sympathy for Amanda, and I think she’s often cast as the domineering mother and I don’t think that’s what she is. Jean as an actor has an incredible ability to complicate or humanize characters that someone else might just put in a “mean” category. I think her portrayal of Amanda also helps us see the humanity of her. And I think the play also tries to help us see that everybody is special in some way, and it’s up to us to find that in each other, rather than just saying ‘well, this person doesn’t fit in.’ Yes, Laura doesn’t fit in, but Tom doesn’t fit in either…so in some ways, as we all struggle to fit in we sometimes take away those edges of ourselves, the things that make us unique. Rather, let’s see every person as an individual, and find what they’re about. Remaining performances of The Glass Menagerie will be Thursday-Saturday, February 22-24 at 7:30 p.m in the DeWitt Center main theatre. The Hope College Theatre Department is proud of the hard work and effort of their students. Hope Theatre participates in the Region III Kennedy Center American College Theater Festival. The annual regional theatre festival is a gathering of more than 1,300 college theatre students and faculty who join together to showcase the best work of the five-state region of Indiana, Illinois, Ohio, Michigan and Wisconsin. In addition to invited productions that are juried and selected to perform, theatre students also have the opportunity to display their work in dramaturgy, design, stage management, directing, playwriting, musical theatre, as well as acting. This year, Hope College received incredible recognition. Senior Akia Nyrie Smith and her scene partner senior Sam Hill, received the Irene Ryan Acting Scholarship Award, sophomore Emmie Sandstedt received the Stage Management Fellowship, and junior Rachel Dion was selected for the KCACTF/Lort Leadership Award for artistic administrators. These four students will represent Hope College and attend the National KCACTF festival at the Kennedy Center in Washington DC in April. Senior Akia Nyrie Smith and her Irene Ryan partner, Sam Hill. Other special recognition at the festival included participants and their scene partners who advanced to the semi-final round of the Irene Ryan Acting scholarship: senior Kierney Johnson and her partner senior Elizabeth Schonfeld, junior Rachel Dion and her partner sophomore Maxwell Lam, and sophomore Gracen Barth and her partner junior Shanley Smith. The Irene Ryan semi-finalists and their partners. 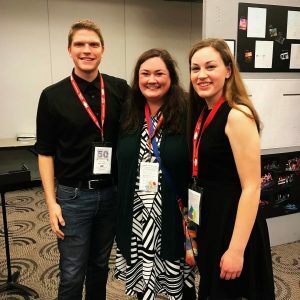 Senior Nathan Gingrich was a Stage Management finalist and sophomores Teresa Cameon and Katie Joachim were finalists for the Musical Theatre Intensive that included an opportunity to perform in the Musical Theatre Intensive showcase. Sophomores Katie Joachim and Teresa Cameon. Senior Nathan Gingrich alongside Theatre Office Manager Reagan Chesnut and sophomore Emmie Sandstedt. 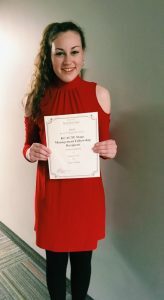 Other accomplishments at the festival include the Irene Ryan Acting Scholarship participants and their scene partners – junior Jose Angulo and his partner junior Brynne Fritjofson, junior Olivia Lehnertz and her partner senior Griffin Baer, and junior Katrina Dykstra and her partner sophomore Katie Joachim. Junior Olivia Lehnertz also participated in the Dramaturgy program. Junior Olivia Lehnertz presenting her dramaturgy research. 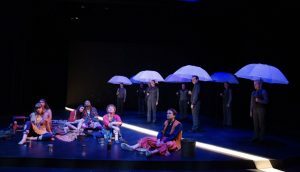 Hope College Theatre Department was also selected to tour their production of “The Line Between” as a participating production to the festival. This regional recognition was a great honor for the entire cast and production team. “The Line Between” had two performances on during the festival. 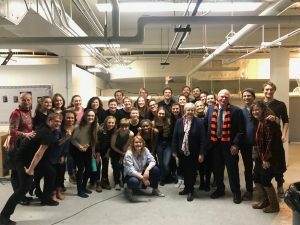 The cast and crew of “The Line Between” with Hope College President Dennis and Betty Voskuil. 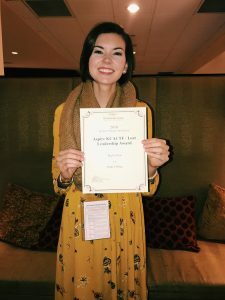 Congratulations to the Hope College Theatre Department for the honors received at the festival! Hope College Theatre alumni Emily Svendson (‘15) has been backstage on Broadway as a wardrober for WAR PAINT. Starring Patti LuPone and Christine Ebersole, WAR PAINT is a new musical about the women who dominated the beauty industry, Helena Rubinstein and Elizabeth Arden. With fierce competition, the two women sacrificed everything to become two of the country’s first major female entrepreneurs. Svendson has been working with the production for the past year and a half, starting with the early stages in Chicago. “WAR PAINT has been the most difficult and most rewarding journey I have been on. This show has been a huge part of my life for the last year and a half. 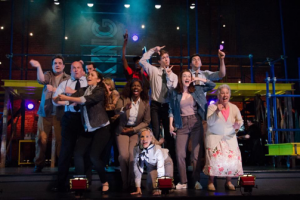 I worked on the out of town last summer at the Goodman Theatre and even then in its early stages, it was a huge, challenging show. Once we started in New York, I knew most of the company from the summer but there were a million of new challenges and problems to face. From learning Union Rules, adjusting to little bitty living spaces, and many others, I have learned so so much about myself as a dresser, an artist, and as a human. It’s been the most surreal experience. 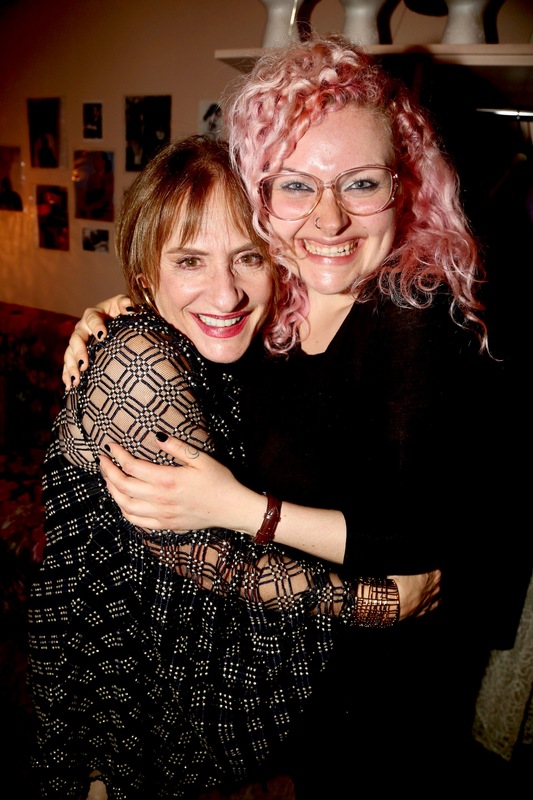 If you told thirteen year old Emily (who sat in her room and cried to I Dreamed a Dream almost every day) that she would do a quick change with Patti LuPone, she would have thrown cheese in your face,” Svendson said. As a wardrober, it is Svendson’s job to maintain costume quality during every performance. She assists with quick changes, attends to costume mishaps and makes sure that everything is ready to go. Some off-stage changes can be as quick as 30 seconds! 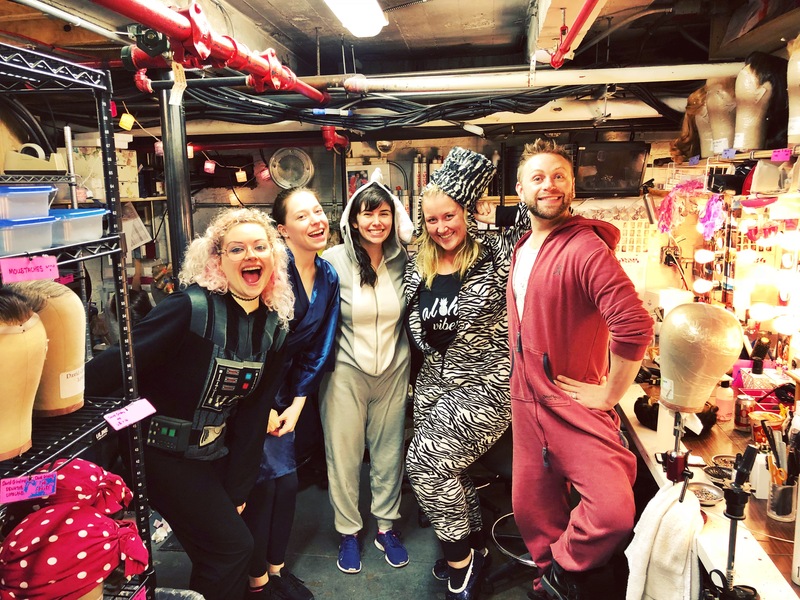 During performance, Svendson and her crew would start little backstage rituals to keep the buzz of backstage bustling – whether it be high fives to the beat of the music or spending time with Ms. LuPone when she was around. 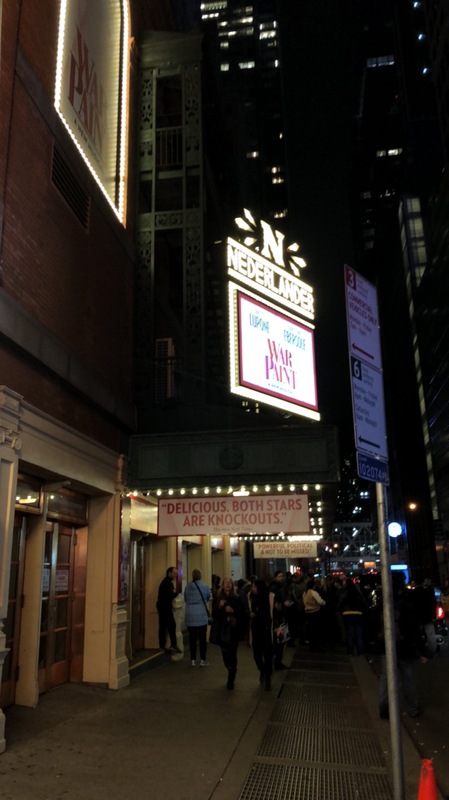 WAR PAINT gave its final performance on Nov. 5 so LuPone can undergo immediate hip replacement surgery. For Svendson, closing week was crazy and strange. “We were fortunate to know that it was coming (sometimes you don’t get much notice) but it’s still en ending of a huge chapter. During the week, we spent our down time getting ready for load out: cleaning out dressing rooms, sending every costume to dry cleaning, organize accessories. Our closing performance was one that was really special. The energy from the audience was positive and full of love, which made everything that we were doing worth it. Change is always hard but it brings bright new beginnings,” Svendson said. Now that the production has closed, Svendson hopes to trust the process and continue to find more work. What happens to our students after college? In this series we will look at Hope College alumni taking on the real world in no other city than Los Angeles. To begin our series we will start with Hope alum, Chad Coe, a 2004 graduate with big dreams. We are so proud to see his dreams becoming a reality. Born in Detroit, Michigan, Coe was originally recruited to Hope by the basketball team. However, the summer before freshman year Coe became ill and was not able to join the team in the fall. 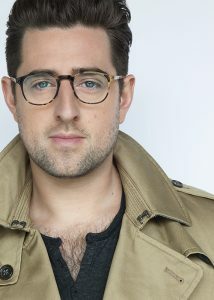 During this time, Coe was inspired by his brother, a student at NYU, who was shooting a feature film. Excited about a new passion, Coe quickly joined Hope’s theatre program in hopes of chasing a similar dream to his brother’s. “It was kind of a serendipitous moment for me,” Coe explains. He acted in plays in elementary and high school but when he took his first acting class with Professor Jean Bahle, Coe knew theatre was the right fit. Though Coe actually graduated with a communication degree from Hope, he was a huge part of the theatre program. 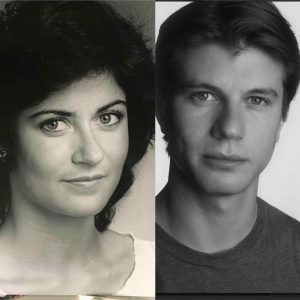 From his favorite role in Hope’s devised piece, The Rose and the Rime, where he and the cast performed in Washington D.C. on the Kennedy Center stage for Kennedy Center American College Theater Festival. Coe threw himself into theatre productions and took every acting class the department had to offer. Coe is thankful for the technique he learned at Hope that served as a foundation for taking his craft out into the working world. In the midst of his TV and theatre career in L.A., Coe began to lose the “why” in acting career. What was he doing all this for anyway? 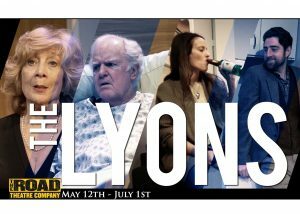 Last spring, Coe was cast in the Nicky Silver play, The Lyons. 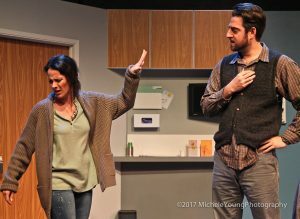 The play is a dark comedy about family relationships. The production was in an intimate venue in the city and ran for a 5 months- A long run in the city of L.A.
What draws Coe to L.A. is the creativity surrounding him. Need a drummer? Ask the neighbor. Need a graphic designer? Ask the barista. Creativity is wheeling in and out of every conversation and the collaborative opportunities are never ending. We are proud of our Hope alums and the contribution they are making to the theatre scene in Los Angeles. Daina Robins, Professor of Theatre and Chair of the Theatre Department, has co-led a May term to Ireland for the past four years. 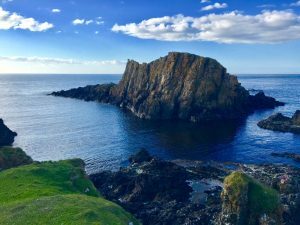 Professor emeritus John Tammi led the first Ireland May term in 1996, But now Robins joins him as they take a group of students through winding cobblestone streets and incredible cliff side views. The aspect Robins loves most about leading with Tammi is the fact that he is a wonderful storyteller and has a terrific sense of humor, two things that blend right in with Irish culture. The traditional classroom is transformed into a mystical, magical, foggy fairytale as students learn about the culture by interacting with it day in and day out.The students pile into 9-person vans and travel throughout the countryside in order to soak in everything Ireland has to offer. The trip takes you through Dublin, Belfast, Galway, and other small towns that are filled with quaint pubs, gorgeous landscapes, and rich history. 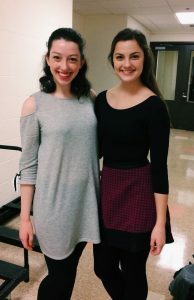 Even though Robins and Tammi have theatre backgrounds, you do not need to be a theatre major or even interested in theatre in order to partake in this incredible opportunity. Conversations spring from the rich cultural heritage that is woven into the roots of the country. Conversations of politics, history, poetry, religion, people, and politics evolve in the vans between visiting historic sites, museums, and theatres. Primarily built as a Senior Seminar, the Irish Culture and Celtic Wisdom May term culminates in students writing a life view paper. The class gives students access to the Irish people and culture and prompts them to ask deeper questions of themselves. This term is three plus weeks of self-exploration through the study of Celtic culture, Irish people, and the way others live and breathe the same way we do on the other side of the ocean. The DeWitt stage was the location for the first of a workshop series for the launch of faculty member Rich Perez’s new devised project. 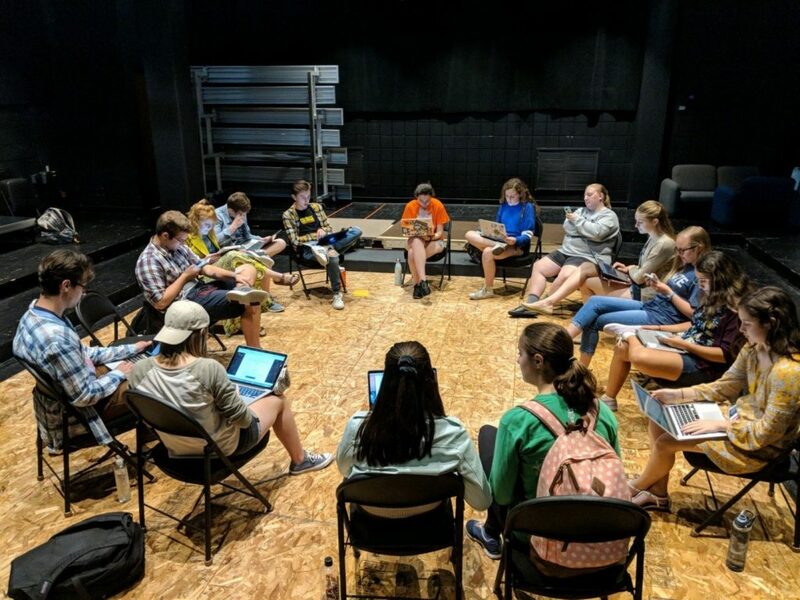 The Hope College Theatre Department has a strong commitment to creating new plays and specifically devised work. The department has partnered with Nathan Allen for Rose and the Rime (2007) and with The Hinterlands for Goodbye Beauty, Hello Dust (2015) and recreated The House Theatre of Chicago’s, The Sparrow (2015). Last spring, students devised The Line Between with Hope Theatre alums Dan Kwiatkowski and Erik Saxvik. The opportunity sparked a flame for students to use their voices and tell their own stories. Devised theatre is a collaborative process in which the script is developed with the entire company of actors and designers. The method can vary, but in The Line Between, students created the work through workshops, writing prompts, movement exercises, imagery, and structured improve, to create the original play. This upcoming spring, that flame with spark again. 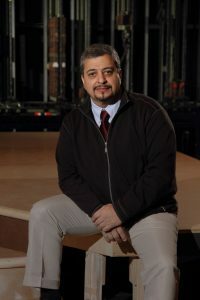 Faculty member Rich Perez will direct the final production of the season, a devised piece completely created by students. The production hopes to pull influence from the classic Western and martial arts. Perez hopes to take these dominantly male genres and flip them on their heads – creating opportunities to showcase powerful women. The workshop began with the group of students participants split into three groups – poets, musicians, and dancers. Each group took 20 minutes to come up with a creative presentation in their area with only the word ‘transformation’ as inspiration. 20 minutes later, each group gathered and shared their performances. The musicians had each brought an ordinary object – a fork, a knife, a box of push pins – and together they created a groovy kind of orchestra. The dancers began spread out across stage and each started slight movements in their own time. Together they clumped in the middle, reaching toward the sky. Continuing their performance, they formed into a single file line and followed each other and repeated the movements of the leader at the front. The poets stood up and each person read a short five to eight line poem they had wrote. Each one offered a new take on the word ‘transformation’. Perez couldn’t have been more thrilled about the workshop. Professor Perez, known as Rich, quirky and kind, radiated a welcoming, creative presence as I took a seat across from him in his office. There is no question this Hope College professor is determined to bring diversity and edge to the program. With a passion for inclusion, Rich often dedicates his time and efforts to produce diverse, thought provoking theatre and this summer was no exception. As a part of the Latinx community, Rich found the perfect project to continue achieving that work. 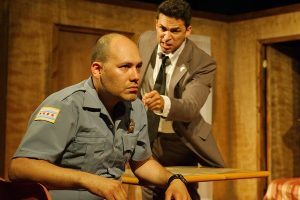 This past May, Rich went to Chicago to direct Water and Power with the Urban Theatre Company (UTC ) This play, by Richard Montoya, was originally set in Los Angeles. In order to make it more relevant to a local audience, Montoya adapted the script to take place in Chicago for the UTC production. The theatre rests in a cozy little storefront in the middle of Humboldt Park, a predominantly Puerto Rican neighborhood. Water and Power grapples with the questions of politics, power, and what it means to be “good”, in a society that often blurs the meaning of those words. This season at Hope College, Rich is directing the play Human Error; a complex comedy that wrestles with the complexities of divisiveness between progressives and conservatives. Rich ended our interview stating, “If nothing else, theatre should initiate lively conversation, long after you leave the playhouse.” For more details about our production of Human Error click here. We our proud of our faculty working professionally during their summers. In this series we meet the faculty and hear about their work! Walking into her new office, you are greeted with an eclectic, ceramic puppet tauntingly hung with strings from the wall. Colors dance around the room and Hope’s very own Director of Theatre sits behind her desk. Michelle Bombe, Professor of Theatre, Director of Theatre, and Resident Costume Designer (Whoa titles!) obviously wears many hats in the Department. Her hard work and dedication to the craft of theatre is what keeps the spark alive and possible for many of her students. Along with her roles during the school year, Michelle has had an active professional career with 10 summers at Kentucky Shakespeare Festival, 1 summer at Theatre at Monmouth and a total of 18 summer seasons at Hope Summer Repertory Theatre. HSRT is a professional theatre company right here on Hope’s campus. This past season, she designed the costumes for Working. Michelle enjoyed designing a production sharing “real stories that opened up different and diverse ways of thinking” for Holland Michigan. We are so glad the two of them share such a deep love and passion for the arts!